There are very less film makers in malayalam who are known for their excellence in reaching movies to the international audience. Among them the name of Shaji M Karun stands ahead. With an experience standing behind the camera as director and cinematographer, Shaji had been the in the field for the past 25 years. Even though he is created with only 4 movies as director, all of them got well recognition and also considered landmark films in Indian Cinema. After helming the direction for Piravi, Swaham, Vanaprastham, Nishad and Kutty Shranku, he is gearing up for his next venture. Titled 'Swapaanam', the movie will focus on the life of Unni, a chenda artiste. 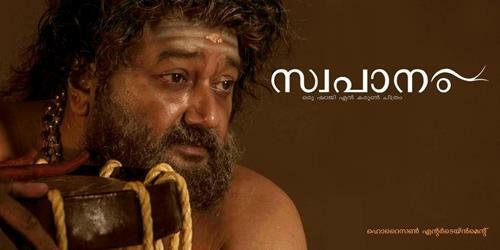 Jayaram who had been in the industry for the past 25 years is to a remarkable character not ever happened in his career. He who dons the character role of Unnikrishnan is expected to bring more appreciation while Shaji too for the naturalistic making. Produced by M Rajan under Horizon Entertainments, the movie will have Bengali Odissi dancer Kadambari, Siddique, Lakshmi Gopalaswamy, Kalamadalam Kshemavathi, Udhayan Namboodiri, P D Namboodiri and others. Having keen interest in playing Chenda, Jayaram has played it at various temple festivals also at the Chottanikkara Temple and Thrissur Pooram. So the director would be convenient to have a chenda enthusiast actor in the lead for 'Swapaanam'. The movie throws light on to the work of the chenda artistes in Kerala and how their work is often recognised by the society. It centres on the pain and sorrows of a creative artiste who is being labeled by the society as a mad man. Kalamandalam, the renowned Mohiniyattam dancer would lend her artistic talent on silver screen as the movie passes through the cord between a chenda player and a Mohiniyattam dancer. Being a skilled person in chenda, Jayaram can practice and perform adding more to its realistic approach. Around 150 renowned chenda players will be part of the cast. Harikrishnan and Sajeev Pazhoor have written the screenplay while Sajith Nair serves as the cameraman. For the lyrics of Manoj Karoor, Srevalsan Menon has lent his magical touch for the music.